This site provides an introduction to the history of the Royal Flying Corps and its aircraft during the First World War, together with links to other related sites and suggestions for further reading. Subsidiary sites look in more detail at four squadron histories and the experiences of a number of RFC officers; links to these are on the page "A Pilot's War" tab above. Updates on the RFC/RAF Personnel List of those mentioned on this site. The Royal Air Force celebrates its 100th anniversary on 1st April 2018. See link for the Air Ministers remarks in 1918 regarding "our Flying Men" together with contemporary comment and background. A BE2c of No 2 Squadron prepares to start off on a reconnaissance mission, Summer 1915, Hesdigneul, France. At the commencement of the First World War Britain had some 113 aircraft in military service, the French Aviation Service 160 and the German Air Service 246. By the end of the war each side was deploying thousands of aircraft. The RFC was formed in April 1912 as the military (army and navy) began to recognise the potential for aircraft as observation platforms. It was in this role that the RFC went to war in 1914 to undertake reconnaissance and artillery observation. As well as aircraft the RFC had a balloon section which deployed along the eventual front lines to provide static observation of the enemy defences. 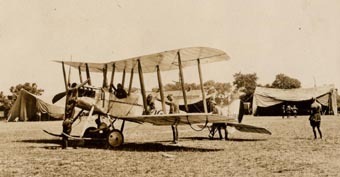 Shortly before the war a separate Naval Air Service (RNAS) was established splitting off from the RFC, though they retained a combined central flying school. The RFC had experimented before the war with the arming of aircraft but the means of doing so remained awkward - because of the need to avoid the propellor arc and other obstructions such as wings and struts. In the early part of the war the risk of injury to aircrew was therefore largely through accidents. As air armament developed the dangers to aircrew increased markedly and by the end of the war the loss rate was 1 in 4 killed, a similar proportion to the infantry losses in the trenches. The RFC was also deployed to the Middle East, the Balkans and later to Italy. Initially the Middle East detachments had to make do with older equipment but were eventually given more modern machines. The RFC (in relatively small numbers) was able to give valuable assistance to the Army in the eventual destruction of Turkish forces in Palestine, Trans Jordan and Mesopotamia (now Iraq). In the final days of the RFC, over 1200 aircraft were deployed in France and were available to meet the German offensive of 21 March 1918 with the support of RNAS squadrons. From 1 April these forces combined to form the Royal Air Force as an independent armed service. From small beginnings the air services had grown by the end of the war to an organisation of 290,000 men, 99 Squadrons in France (with 1800 aircraft), a further 34 squadrons overseas, 55 Home Establishment squadrons and 199 training squadrons, with a total inventory of some 22,000 aircraft. Major General HughTrenchard as Commander of the RFC in France for much of the war was the driving force behind the expansion of the air service supported by the Director General of Military Aviation Major General Sir David Henderson. General Trenchard was strongly committed to supporting the ground forces and sharing their burden of attrition. He convinced the Army Commander-in-Chief, General Haig, of the contribution of the air service and won his support for the expansion of the RFC in France (against the competing pressures for home defence and a long range bombing force, which ironically, Trenchard was later to command). A Pilot's war gives a more detailed insight into life in the RFC from the perspective of a number of officers. In memory of Sgt Matthew Marmion, 4th Battn. Royal Fusiliers, killed in action with the BEF on 24 August 1914 at Mons, an early casualty of the Great War.